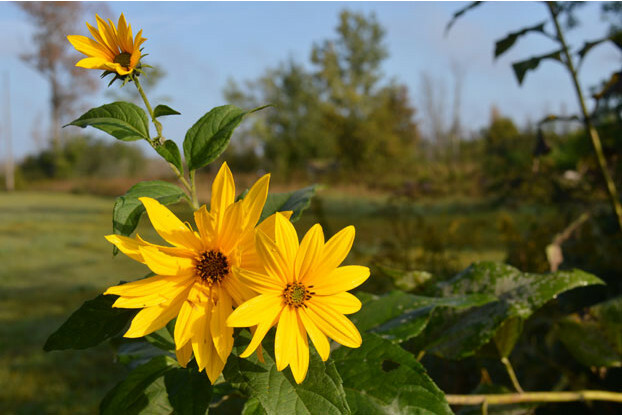 "Native to the Great Plains region of the U.S., the maximilian sunflower is a tall perennial that can reach a height of six feet, or taller in some situations. Each stalk is topped with multiple yellow sunflowers that bloom from summer into fall. Prefers full sun and drier soils. Excellent for adding height to the background of a wildflower garden, or can be utilized as a hedge or privacy screen. It’s also beneficial to birds and other wildlife. Scientific Name: Helianthus maximiliani "
Native to the Great Plains region of the U.S., the maximilian sunflower is a tall perennial that can reach a height of six feet, or taller in some situations. Each stalk is topped with multiple yellow sunflowers that bloom from summer into fall. Prefers full sun and drier soils. Excellent for adding height to the background of a wildflower garden, or can be utilized as a hedge or privacy screen. It’s also beneficial to birds and other wildlife.